Just put together this presentation for this Freshman Cluster’s seminar here at UCLA. Their instructor is assigning them this assignment in which they have to curate a collection related to the “history of Los Angeles” using Omeka – a free online curatorial platform. I’m eager to see what they come up with. I’ve presented on building Omeka sites before (here’s my sample site that I plan to one day turn into something relevant to my dissertation), and the major issues that come up have to do with the relationship between “Collections,” “Exhibits,” “Sections,” “Pages,” and “Items.” Miriam Posner’s great handout is helpful (click here). Put simply, the best way to use Omeka is to think of it as a museum. Items are your museum’s objects. You upload images (or an image) of them and classify them according to Dublin Core metadata fields. You store them in collections – which I think of shelves or storage rooms in the back of the museum. But just as you wouldn’t be able to store a sculpture in two different rooms at the same time, you also can’t store an Omeka item in two different collections. Once you have amassed a good number of items (and arranged them into collections – or not), you can then put together an Exhibit. An exhibit in Omeka has sections, just like an exhibit in a museum has different rooms. Pages can be thought of as walls in that room of that exhibition. 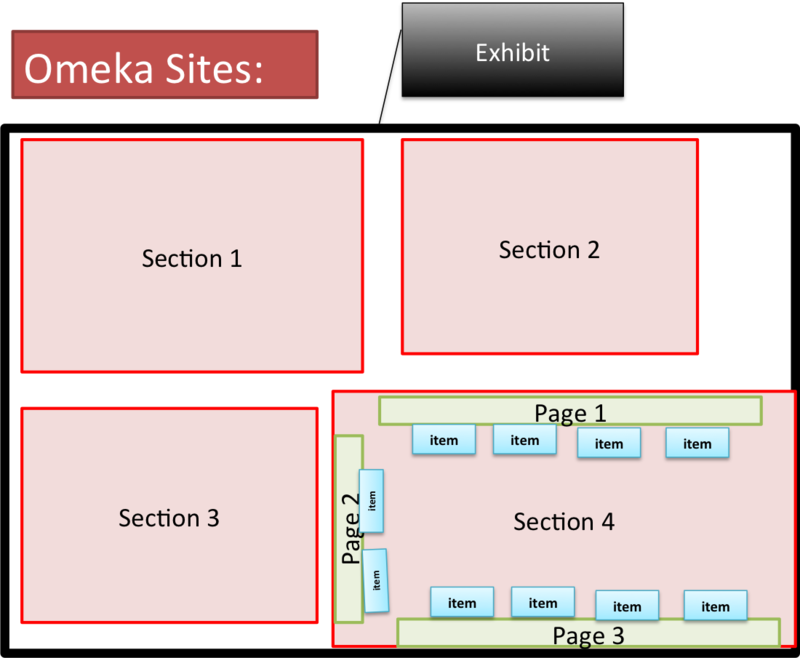 Here’s a visual rendering of the relationship between Exhibits, Sections, Pages, and Items in Omeka. So for example: let’s say in your exhibit on “British Tourism” (to borrow from my own research), you organize one room for maps and one room for souvenirs. Then you would put all of Byron’s souvenirs on one wall and all of Dickens’ on another one. The room for maps is one section and the wall of Byronic souvenirs would be a page on Omeka. Does that make sense? I hope so. Omeka is good for making exhibits – but people run into problems when they try to square-peg-round-hole it (like by using it as a blog). There are some other features worth noting about Omeka – its multi-curator capabilities, its various themes, tagging, making public v. private items, adding simple pages for content, featuring items/collections/exhibits etc – but it’s best, when presenting on it, to start by clarifying the relationship between collections, exhibits, sections, pages, and items (the Omekan macrocosm to the Omekan microcosm!) before delving into too much detail about the other features.